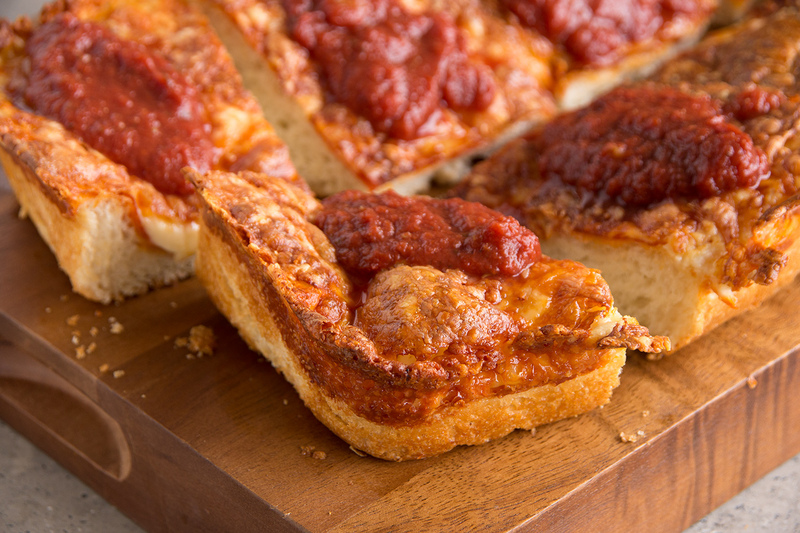 This is a traditional Detroit Style Pizza that you can make at home. 9×13 inch rectangle. Place dough in a sprayed 9×13 inch pan to completely cover the bottom. Cover with plastic wrap and let rise until double. While dough is rising, pour crushed tomatoes in a saucepan and add seasonings. Heat until warmed through. Remove wrap from dough and place a layer of pepperoni over the risen dough. Combine both cheeses and sprinkle liberally across the top, building it up on the edges. Bake at 450 degrees F 15-20 minutes. Loosen from sides and remove from pan to a cooling rack. Top each piece with the warm crushed tomatoes mixture before serving.